Growing up, we learned from Greek mythology that Phlegethon is the river of fire coursing through the domain of the underworld. However, what few people realize is that the city of Cleveland is the source of an earthly fire river of it’s own called the Cuyahoga, which despite all logic and reason has been set ablaze as many as 13 times since 1868! Industry of all variety made a home along the river’s edge, leading to the dumping of enormous quantities of waste into the river that ranged from fertilizers to sewage, garbage, and even industrial chemicals as well. Sadly, there have been few rivers in the country that have been as degraded as the Cuyahoga during the past few centuries. Cleveland grew as an important hub for industry as it rose from the post-civil war era with industry and commerce to drive it forward. Between 1860 and 1870 the city’s population more than doubled, putting added strain on the already stressed river’s ability to handle rising levels of contaminants. As the industrial revolution lunged forward it brought the city with it, transforming the river and surrounding area into a virtually unregulated industrial park. 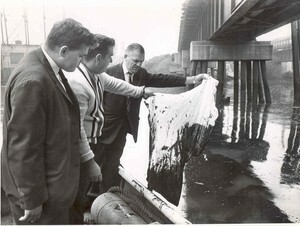 Dumping of undesirable materials into the river became commonplace. Oil slicks multiple inches thick could be seen running through the top water of the river. With flammable liquids floating on the top of the river, and debris everywhere, it was only a matter of time before it eventually caught fire. And for the first time in 1868, it did. Inexplicably to the common sense and logic of environmental stewardship that we all practice today, the initial river fire did not attract enough attention to impose any regulations on the dumping of hazardous, flammable materials into the river. So what changed? 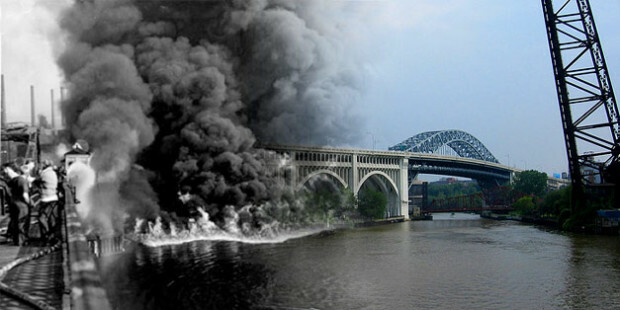 On a Sunday morning in June of 1969, the Cuyahoga River burst into flames when sparks from a passing train caused an oil slick to catch on fire. The fire caused more than $100,000 in damages, quite a lot of money at the time. While this wasn’t the first instance that the river caught fire, it was certainly the last. Due to the mythical nature of the event, and the right blend of activism, news coverage, and environmental degradation tipping points, the event sparked an environmental revolution that saw changes to both the Cuyahoga and environmental laws in general. Cleveland’s mayor at the time Carl Stokes found himself at the epicenter of this environmental movement, even testifying before congress to advance regulation of industry for environmental concerns. Stokes’ efforts helped pass the federal Clean Water Act of 1972, and essentially inspired the formation of the Environmental Protection Agency (EPA) which provides protections for the Cuyahoga and all other aspects of the environment even to this day. Over the past twenty years more than $100 million dollars has been invested into river restoration efforts to clean up the water and make it less flammable. All told, the area is now a national site, and its mythical status for being on fire will likely soon be eclipsed by its draw as a fishing, boating, and recreation area. Did you know that a river could catch fire? Have you ever visited the Cuyahoga River? If so, tell us about your experience in the comments below!